According to the Tax Foundation, “Tax Freedom Day” this year falls on April 24th—six days after 2015’s personal income tax returns were due (on the 18th if you forgot to file). 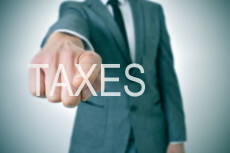 April 24 marks the day on which the average American will have earned enough income to pay his or her total local, state and federal tax bill, which includes payroll taxes, sales taxes, excise taxes, property taxes, corporate income taxes and and taxes on individual incomes. The total bill amounts to $4.9 trillion, of which $3.6 trillion goes to Uncle Sam. Since Americans now spend a bit more than $4 trillion on food, clothing and shelter every year, local, state and federal taxes represent the single largest drain on the typical family’s budget. One interesting wrinkle here is that Pfizer just announced the cancellation of its proposed $160 billion merger with Ireland-based Allergan, owing to worries about new U.S. Treasury rules designed to prevent so-called tax inversions. Such strategies, implemented by, for example, Burger King, which moved its corporate headquarters to Canada, are aimed, rationally it should be said, at reducing a company’s total tax liabilities by relocating to a lower-tax jurisdiction. The federal corporate income tax rate in the United States tops out at 39 percent of taxable income. It is near the top of the list (tied with France) of the highest corporate income tax rates levied by developed nations belonging to the Organization of Economic Cooperation and Development (OECD). Many localities and states also tax corporate income; corporate earnings distributed to investors as dividends are taxed again at the taxpayer’s individual income tax rate. So, too, are capital gains when ownership shares (stocks) are sold. Indeed, because only people pay taxes, a principled case can be made for reducing the U.S. corporate income tax rate to zero.